I dashed home from the low-lit Young Vic bar. Over-sized bag in one hand. New, cowboy-inspired black knee high boots tucked under the other. It was Diwali. I was running late. A quick trip to the supermarket en-route home and I had the ingredients for a festive meal. My hungry sister was hand delivering paneer in exchange for dinner. Cooked in a bombsite housing pots and pans. The Dahi Aloo Sabzi and wok-stirred Paneer Capsicum came out really well. Recipes to follow. But the Diwali-special Kalakand, or sweet cardamom and cheese cakes, became a sticking point. I ditched the idea of stirring them for 35-40 minutes in favour of a quicker approach. First, I baked them in a bain-marie. Big mistake. They were still watery after half an hour. Then I transferred the lot to a small dish for the microwave. Even bigger mistake. Quite. Where would I be without the loving support of my sisters. I sent her home after main course. And finished off the Kalakand. 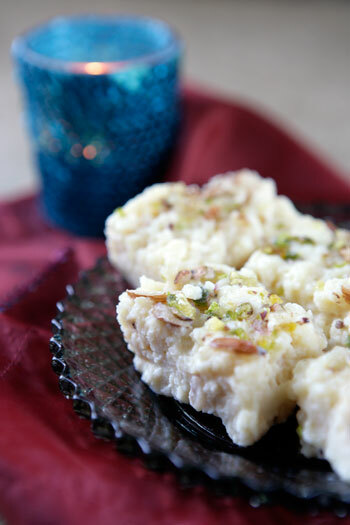 Here is the microwave Kalakand recipe with my new found wisdom. And Happy Diwali. Better later than never, right? Mix the cheese and condensed milk in a microwaveable rectabular dish. You want no more than a 2 cm thick batter in a six-inch deep container. Otherwise it’ll overflow every few seconds. Crush the cardamom seeds and mix into the batter. Microwave uncovered on high for four minutes on a 800 Watts + microwave or five minutes on a lower wattage machine. Then stir for a minute, let it settle and keep microwaving again for one minute at a time until the batter dries up and you are left with a set cake. This means you have to watch the microwave for 10 minutes. But it’s beter than watching the hob for 40! Finally, crush the almonds and pistachios and sprinkle them all over. Leave the kalakand to set in a cool place and then the fridge when at room temperature. In an hour, cut it up into little rectangles and enjoy. OOOOOH! I love kalakand. But am crap at making even the simplest microwave meal. I’ve ruined khandvi TWICE already. Any chance you can post me some?!!!!! Exactly! better late than never. Sweet looks great by the way. perfect sweet and ya better late than never…so hows your health now? wow..thats really some sweet!…good that you did make it! I made 5 batches of this stuff this time. Another blogger had posted it last Diwali i think. Yummy – but you cant make it with Splenda (:. Are congratulations due for Miss Masala ? I am not making this. I’ve gained 5lbs already eating shrikhand, Lapsis and pooris. Nope, not doing it. This looks fun to make, if not dramatic. But I would rather just eat some right…this…minute. 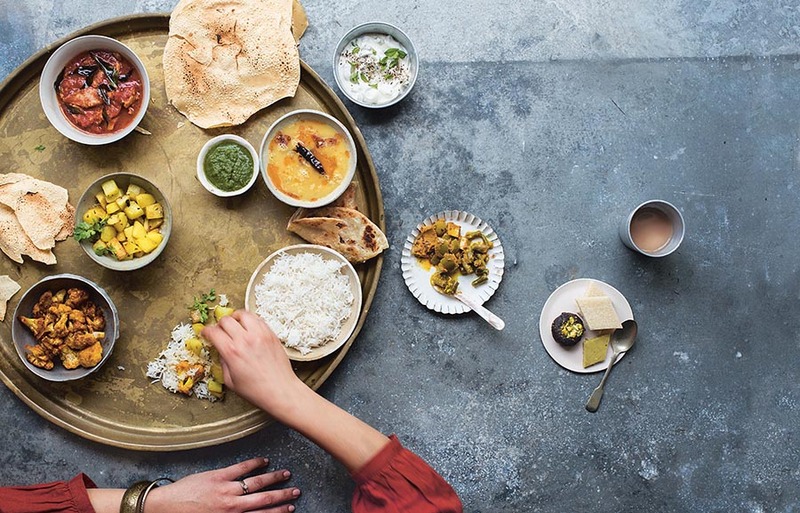 lol 🙂 love your blog – iv recently started cooking – because i HAD to – and im falling in love with it – im not great or anything – but it feels so awesome when something you cooked actually comes out well!! being an overloaded master’s student of electrical engineering, iv no time to experiment – but now im taking weekends off to cook as much as possible. oh my god you’re so right – curry tastes AMAZING when its left overnight!!! keep the great cookin advice comin girl!! How amusing Mallika…& sending them home before dessert, the poor girls! How’s the to-be-Mama doing? Your kalakand looks good & pro. donno if I’ll ever try making it, but your post sure is tempting. My mouth is watering looking at the picture but after tucking half a pound of jalebis over Diwali, I will wait for a month before trying this. Btw I tried your Baigan raita (Dahi Baigan?) for a Diwali dinner I hosted and it was a super hit dish so thank you!